Scarface is the iconic fictionalization of one of history’s most notorious gangsters, Al Capone. It follows Tony Guarino’s harsh upbringing on the streets of Chicago, where a young man unwilling to contemplate a life of humble poverty hungers to reach the big time. Tony has grown up in a world where every gangster is a hero and every cop an enemy, so his path to power is paved with force and brutality. At only eighteen, Tony shoots dead gang boss Al Spingola, and this is just the beginning of his uncompromising journey into organized crime. He eventually becomes the most powerful and feared man in the Chicago underworld, luxuriating in a world of opulence, dames, and danger. But while Tony struggles to balance a life of violence with a code of honour, Scarface ultimately proves an ancient maxim – the fate of those who live by the sword. 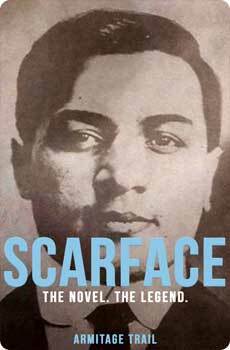 Scarface was first published in 1930, and remains one of the most potent evocations of the origins of American gangster culture ever committed to print, and an ever-green work of cult fiction.